His Holiness Paramahamsa Sri Sri Satchidanandendra Saraswathi Swamiji, the founder of Adhyatma Prakasha Karyalaya and author of over 200 reputed works on Advaita in Kannada, Sanskrit and English blessed the earth with his presence for ninety six useful and rich years (1880-1975). His works are characterized by vast and deep scholarship. Clear and precise perception and an attractive and lively style. His authentic interpretation of Sankara has been greatly recognized by both the East and the West. He was not a just a rare and accomplished individual but a mighty and magnificent institution. This is the first sustained attempt to reduce all the seemingly various methods of presentation employed in the different classical Upanishads to the only comprehensive method. The Adhaaropa-Apavada Prakriya which lays bare the true nature of Vedanta Revelation of the self-existing Reality or Brahman, the one Witnessing Self in all beings. A perusal of the work is sure to revolutionalize many of the current notions regarding the true nature of Sankara`s Vedanta. Swami Satchidanandendra Saraswathi has shown how the one Traditional Method elucidates the central theme of the Upanishads and convincingly reconciles all apparently conflicting doctrines therein. He has also given a brief account of the History of Vedantic Thought up to the time of Sarvajnatma Muni to illustrate how, many a Vedantin has lost sight of the only method which holds the key to the right understanding of the Upanishadic teachings. The book ought to stimulate readers to go in for further details in the original Sanskrit work, the ‘Vedanta-Prakriya— Pratyabhijna’ by the author. 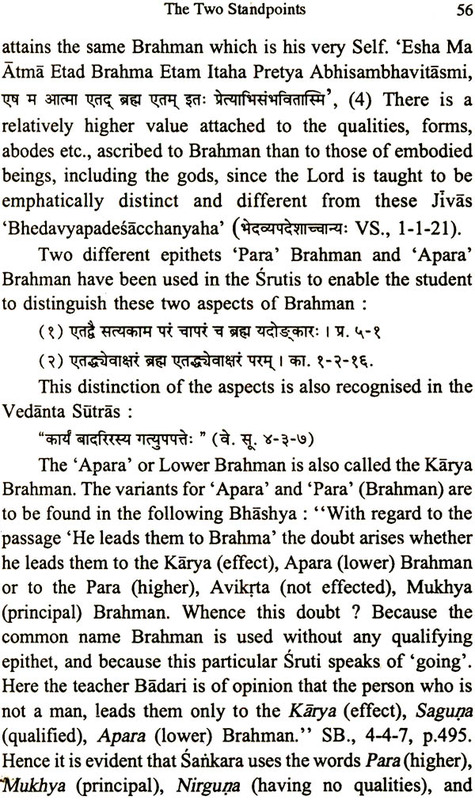 This is the masterly English Introduction to ‘Ved.a11ta Prakriya Pratyabh§1ia’, an original work in Sanskrit by Sri Swami Satchidanandendra Saraswati Maharaj, on the one comprehensive method which lays bare the true nature of Vedantic Revelation of the self—existing Reality or Brahman. As all the copies of the first edition printed way back in 1964 have been sold out, this second edition is now printed in response to an ever—increasing demand. Sri Swamiji has explained here at some length how the traditional method elucidates the central theme of the Upanishads and convincingly reconciles all apparently conflicting doctrines in these sacred works. He has also given us a brief` account of the history of Vedantic thought as far as available from the remotest times up to the time of Sarvajnatma Muni. 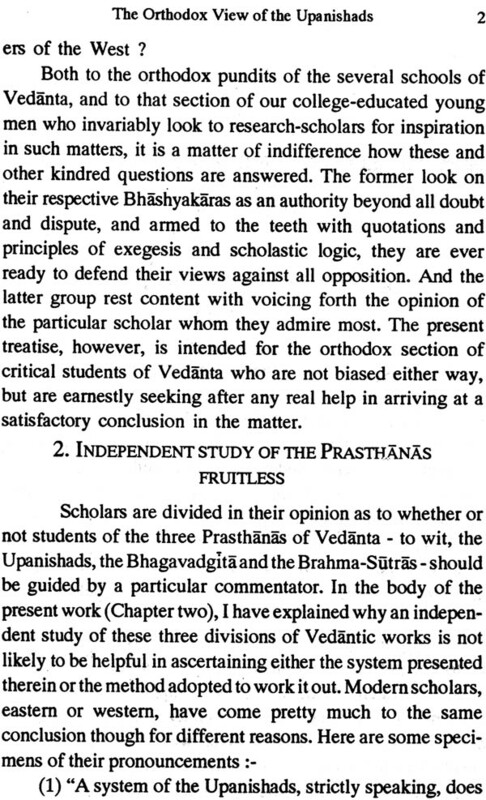 One fact emerges from this brief summary of the different Vedantic schools prior and subsequent to sankara and his grand preceptor Gaudapada. Side by side with the tradition of Absolutism which these two great teachers have indelibly perpetuated in their works, there were other Monistic schools which claimed to represent the original Upanishadic teachings. 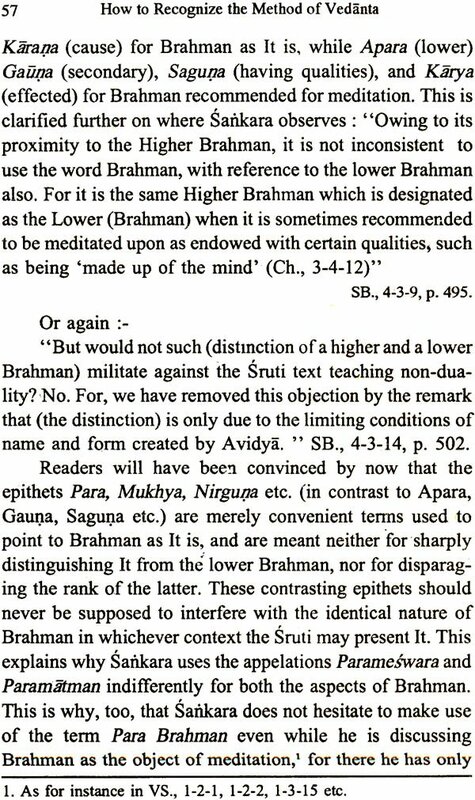 Except for one honourable exception in Sureswaracharya, all other post-Sankara Advaitins, even while professing to explain Sankara, have succumbed either to the influence of the ancient Monists or to that of the later Dualistic Vedantins and thus lost sight of the only method which holds the key to the right understanding of the Upanishadic teaching. Swamiji has made this point abundantly clear through his critical appreciations of the various schools examined in the body of the present work. It is our firm conviction that this is the first attempt of its kind, and that it is sure to revolutionize many of the current notions regarding the true nature of Sankara’s Vedanta. The Introduction is thus in itself a solid contribution to Vedantic thought, and therefore, at the suggestion of some of our friends, we are bringing it out as a separate publication for the benefit of those who would have a handy book at a moderate price containing in a nut—shell the most up-to-date reliable information on Sankara-Vedanta, pure and simple, purged of all later accretions, while also giving a critical account of the distinctive features of the sub-commentaries of the most important Advaitic thinkers. We hope that this publication will be appreciated by all critical students of Vedanta. We are thankful to Shri. Dileep B.K., of M/S L.M.Graphics, Opp. Malleswaram Railway Station, Bangalore—21, for typesetting and also to Sri Lakshmi Enterprises, Chamarajpet, Bangalore for printing this attractive edition. 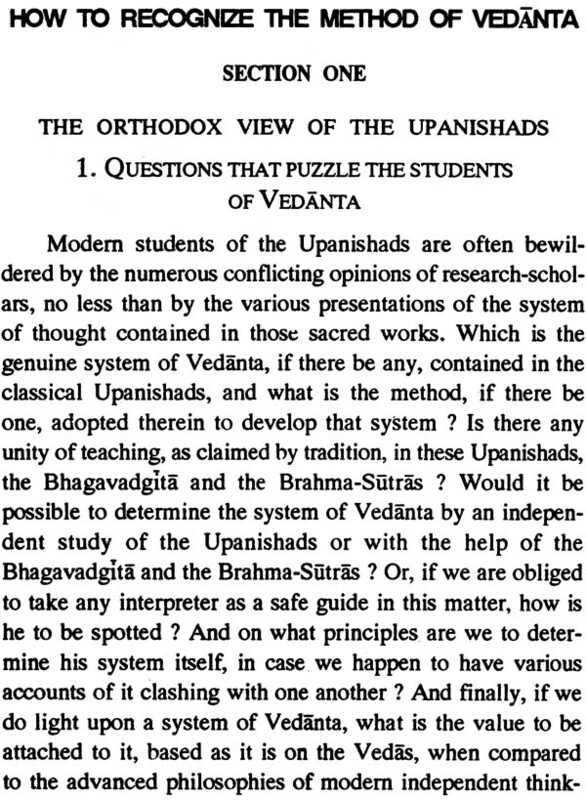 Questions that puzzle the students of Vedanta - Independent study of the Prasthanas fruitless - Primary importance of Sankara’s Bhashyas - Vadantic Traditions - How to determine the system and the method of the Upanishads. The significance of the words ‘Vedanta’ and ‘Upanishad’ - In what sense is the Upanishad a secret 7 - In what sense do the Upanishads contain a system of philosophy? Harmony of the Upanishads, how discovered - The traditional method of Vedanta - Special varieties of the Vedantic method - The basic Super- imposition - The significance of negation in Vedanta - Application of the negation-method. The uses of the empirical view — The two aspects of Brahman — Vidya and Avidya - The transcendental nature of the Knowledge of Brahman - The Highest Goal of life. Gaudapada - Other ancient Vedantins of the tradition. Systems about which only meager information is available – Bhartr-Prapancha – Characteristics of Pre-Sankara Vedanta. Systems independent of Sankara – Mandana – Bhaskara – Sankara’s followers – Sureswara – Padmapada – Vacaspati – Misra – Vimuktatman – Prakasatman – Sucessors of Prakasatman: Anandabodha – Sri Harsha – Chitsukhacharya – Sarvajnatman.